This inspiring shot shows us how to easily pull of three of this season's best trends in one cool look. First, you'll need to to start an earring stack with a mix of standout pieces like the textured hoops we see here. 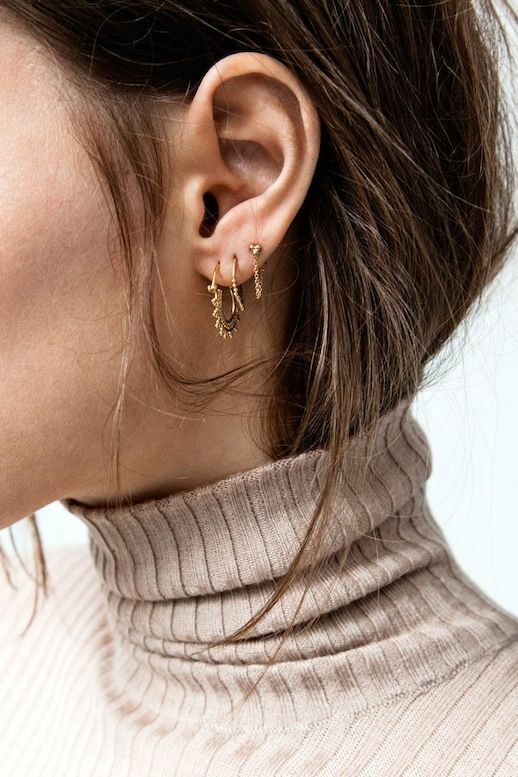 Don't fret if you don't have multiple piercings—Thanks to chic options like this spiral earring from Maria Black, you can fake the look. The next trend to add in is the ribbed turtleneck. These tops will be everywhere this season and can be worn alone or layered. Lastly, to incorporate the third trend, all you'll need to do is tuck your hair in the turtleneck. The hair-tuck has been a fashion industry favorite thanks to the styling at Céline and other top designers.